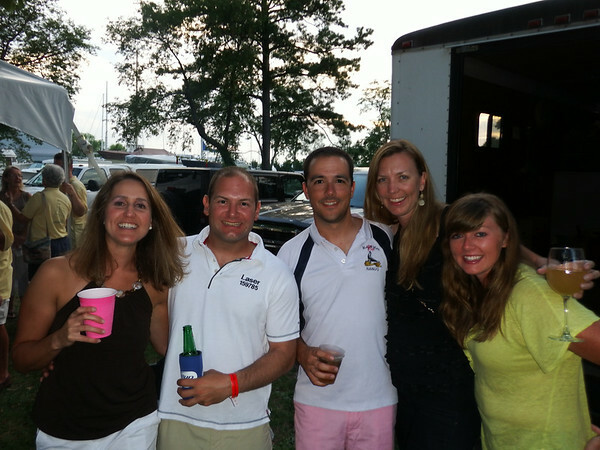 The Screwpile Regatta was another fun summer classic. Thanks to Mayo Tabb for again bringing Excitation and having us along. We sailed the boat well despite being pitted against a bunch of light sport boats that we could never make up our time on. We sailed, we partied, we watched people play Pokémon Go around town. 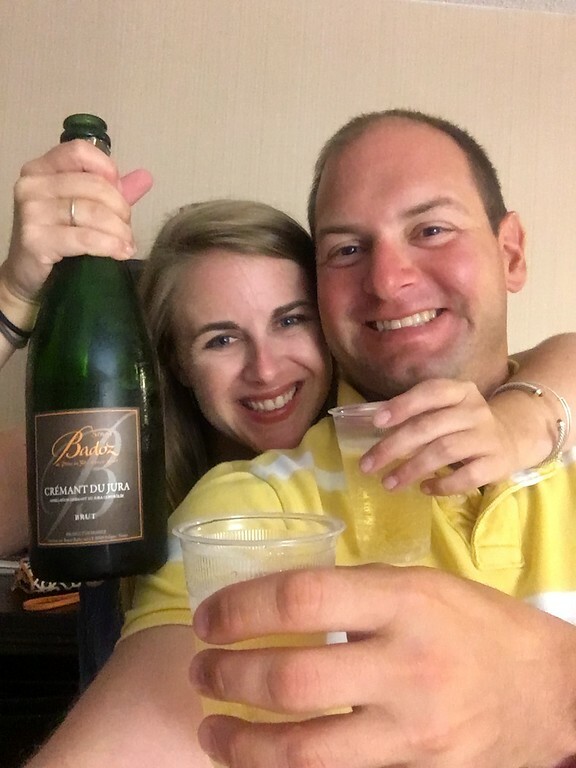 AND I got to celebrate 1 year with my girlfriend Jess! A great weekend all around! 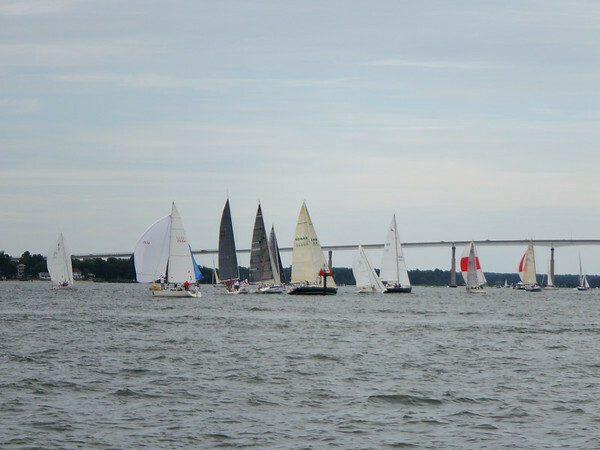 The final day of racing at the Screwpile Regatta and hallelujah we had good wind for sailing! Today’s schedule was 2-3 buoy races under partly cloudy skies and high 80’s temperatures. The racing today was really pretty fun. We were right in the thick of it with boats all around us all the way around the course. Upwind it was a choice between better pressure on the left and a right trending wind along with adverse current on the left. Downwind we had great sets and worked for clear air. We sailed well, didn’t make any major mistakes and closed out the final two races with a 5-4 putting us in 6th place for the regatta. Thanks Sam for having me aboard. 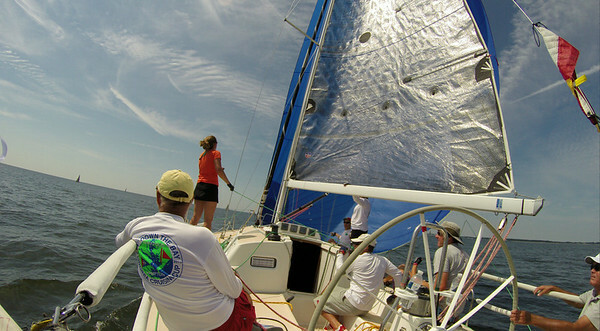 It was great sailing with you, Mayo, Mark, Melissa, Chris, Bonnie, Lauren and Ed. 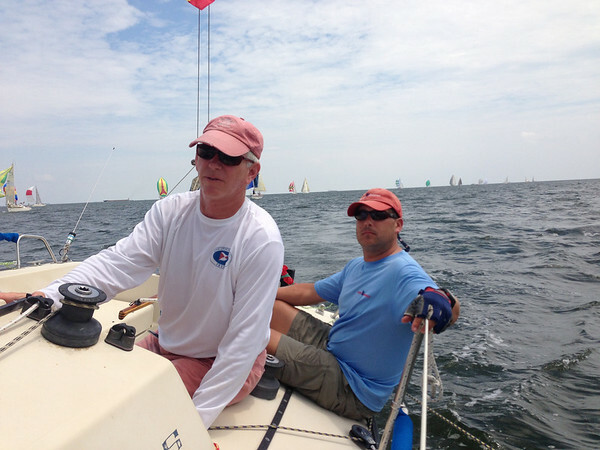 Saturday was distance race day at the Screwpile Lighthouse Challenge Regatta. The regatta has a new format for this year where we buoy race on Friday and Sunday with a distance race in the middle. 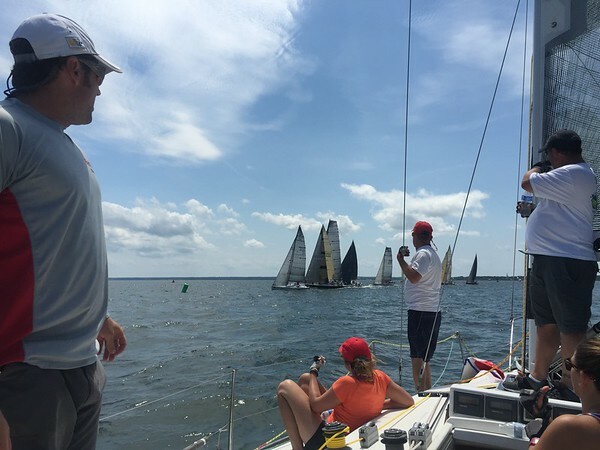 The conditions were good for racing – about 8 knots with mostly overcast skies – a little atypical for this regatta this time of year when we’re used to sunny skies, scorching temperatures and no wind. In this race we were a pinch late at the pin end of the line and watched a few of the faster boats in the water drive to windward of us. For the most part we were low enough to keep a clear lane, but they put some distance between us. 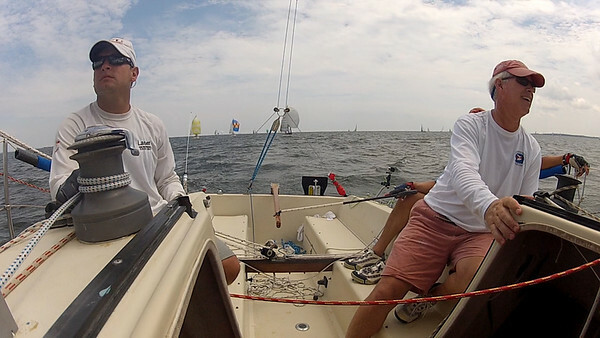 After the first mostly upwind leg, the course took us on a couple of close reaches down the bay. Some of the boats with sails that were close reachers or windseekers were able stretch out in front of us a bit. 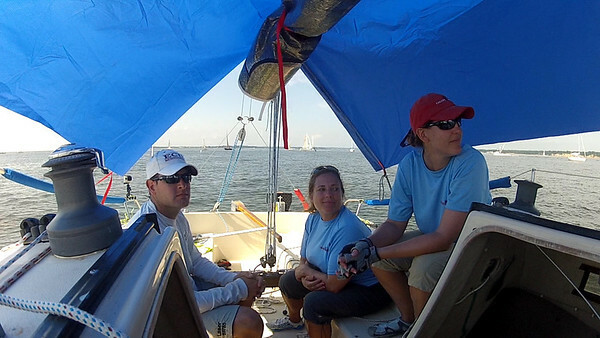 We put up our spinnaker late in the leg once the angles were right. Once we made the turn back in to the Patuxent River the wind started to get lighter allowing us to catch up to the boats already in the river. We rode the wind down the right side of the course as we converged with the smaller boats that had been sailing various courses. There were plenty of crossing situations and boats to be on the lookout for, and it probably made for some great pictures from the helicopter taking pictures of all of the spinnakers in the river. 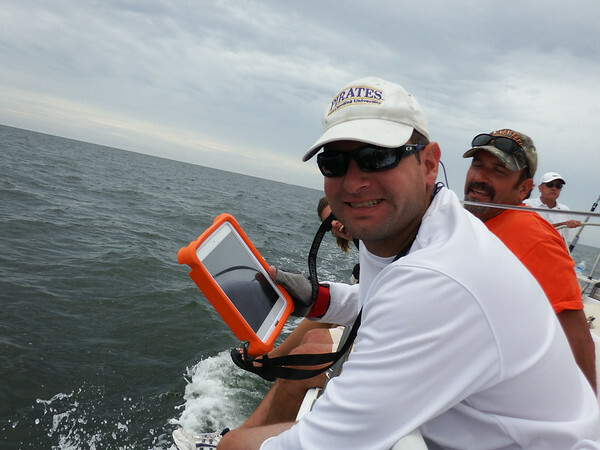 One thing that worked really well for us was having me sitting on the rail with an iPad around my neck doing the charter plotting. We had the boat instruments working as well, but having real time information where we were without having to go below helped keep us on track and out of trouble. When the leaders in our fleet were about a mile ahead of us at the last turn to the finish, we saw something unusual happen. Bad Cat – a local boat with a little over a 7′ draft had run aground in the channel. A minute later VooDoo 2 was rafted up next to them hard aground. A third boat from another fleet wound up next to them as well. We just sailed right on by and were pretty happy with a 6th place finish. 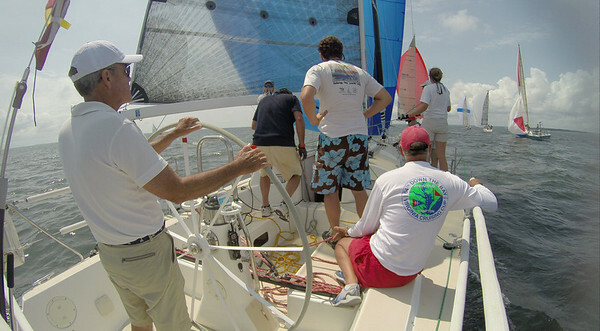 Following racing we had a great cookout with the crews from Persuit, Horizon, GOIN’, Cheeky Monkey hosted by VooDoo 2. Here’s what we sailed today. The blue line is the course and the red dotted line mostly right along side the blue line is our plot. 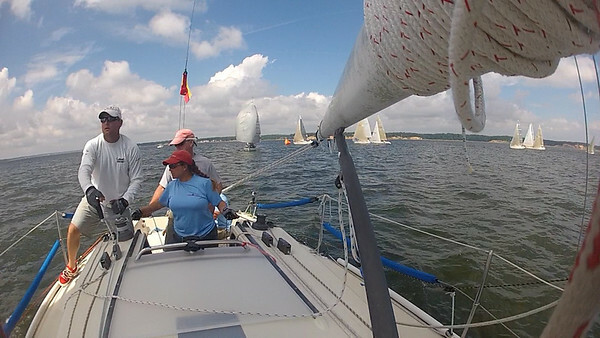 We had some pretty light winds to start the Screwpile Lighthouse Challenge Regatta in Solomon’s Maryland. 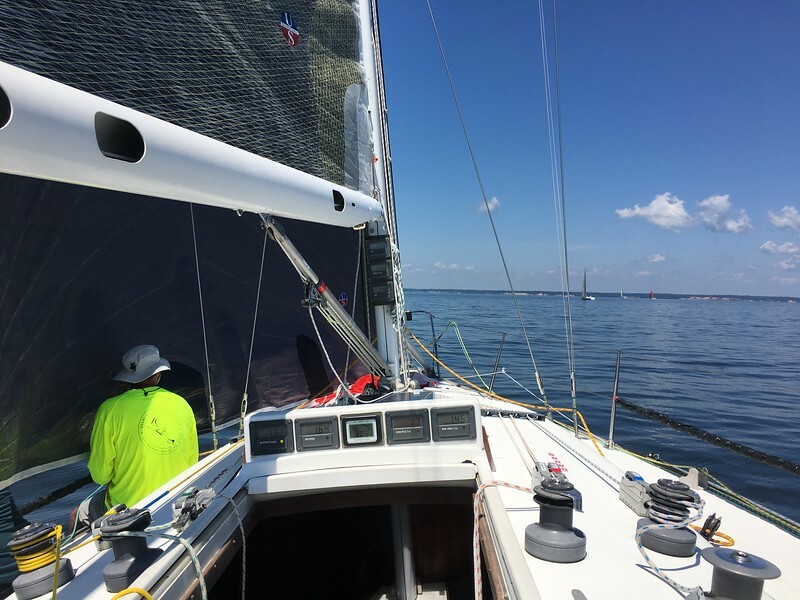 I am sailing on Sam Mitchener’s J/109 Double Eagle this weekend and we are rated as the slowest boat along with the other J/109 in the 10-boat PHRF-A1 fleet. 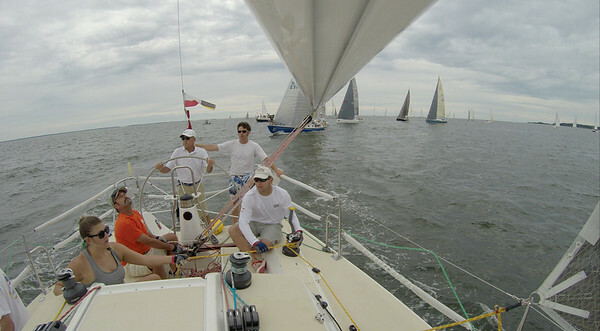 In the first race on Friday we got a good start near the pin in clear air. We worked our way up the 1-mile leg and rounded in the middle of the pack. On the downwind leg the wind started to go from light to lighter. We rounded the leeward mark and started making our way out to the right side of the course following most of the rest of the fleet. Three boats behind us rafted up at the leeward mark and the wind completely shut off. For the next hour and half we would float around trying to make distance towards the now-shortened coarse at the windward mark. At one point we had the anchor down to prevent us from being swept away from the mark by the current. Many other boats did the same. Ultimately, the boats rafted up at the mark came from behind everyone to catch just enough of a breeze on the left side of the course to finish. 4 boats got across the line before the timeline, and the rest of the fleet took at TLE/6. Quite a frustrating day of sailing being out on the water with no wind, a lot of current and not being able to even sail the course. With two more days of racing ahead lets hope the racing only improves. 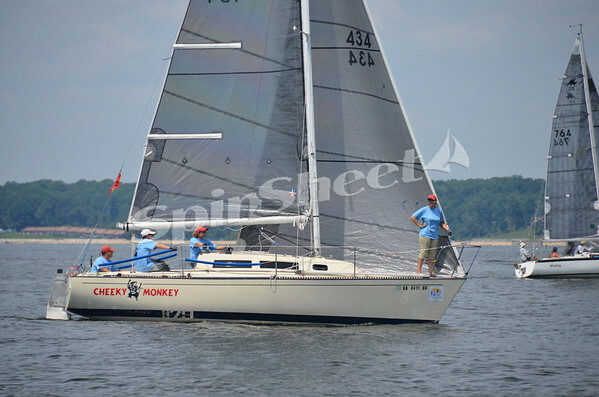 I got to sail my first Screwpile Regatta on Paul and Julie Wash’s S2 7.9 Cheeky Monkey along with Becca Wash and Mike Karn. 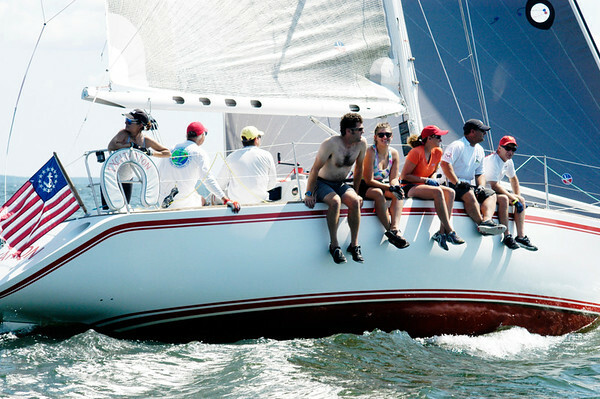 We had a great weekend finishing 3rd in the 13-boat PHRF-C class (results). 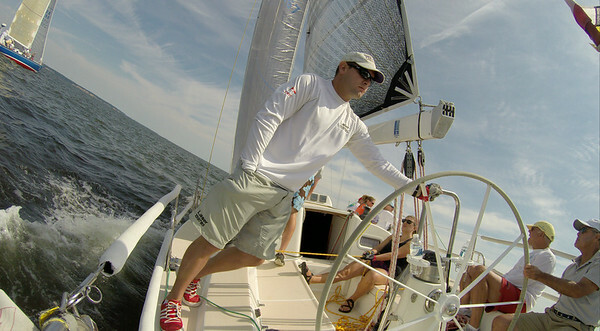 That included finishing out the regatta 2-2-1-1 in the final 4 of the 7 races. 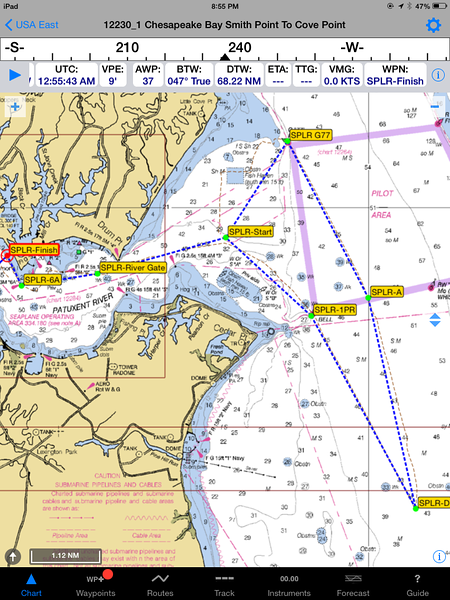 On Saturday I got a ride to Solomons Island Maryland with the Double Eagle crew. Cheeky Monkey was still being delivered so I got to go hang out with Double Eagle for some practice. That was followed by some pool time and then boat work when Cheeky Monkey arrived to get it ready – 1st for sleeping and 2nd for racing in the morning. The transition from sleeping quarters to race boat and visa versa would be repeated each morning and evening. 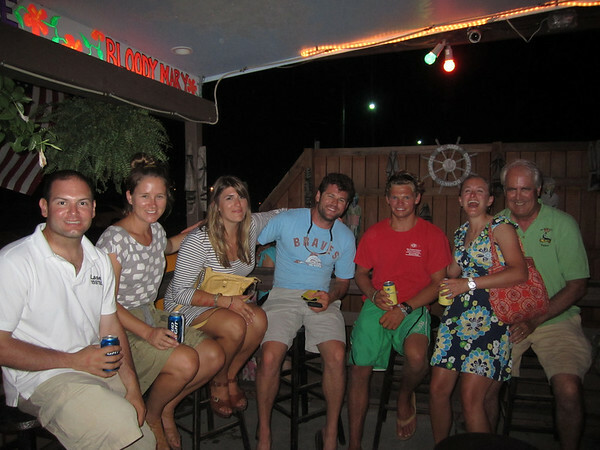 After getting settled I went for dinner in Solomons Island with the Double Eagle crew followed by a trip to the legendary Tiki Bar. The first day of racing called for light wind – and it delivered. 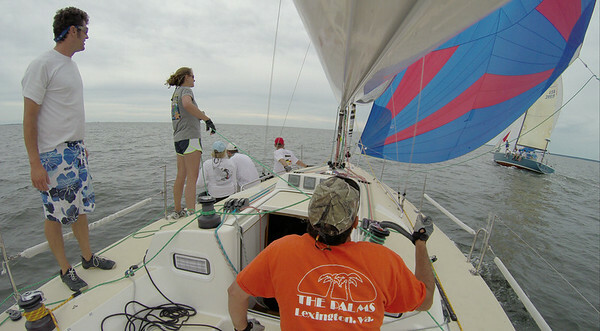 After a short postponement on the water the wind appeared to fill in and we got started. 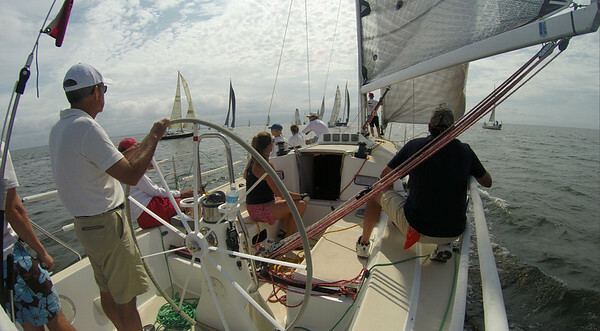 We beat the whole fleet off the start by 20 seconds and led the fleet up the beat as the wind started dissipating. Eventually we had nothing for wind and the race was abandoned. Back at the starting line we threw the anchor out during the postponement and had fun yelling ‘starboard’ at all of the boats trying to stay near the course in the current while drifting into us. An hour or so later the wind finally filled in and we started a light wind race. Most of the racing I’ve done lately has been on boats with 6-8 crew so coming down to a 5-person boat that I had never been on before was a bit of an adjustment. None of it was hard or really all that new, just the timing and coordination that were a little different. When we finally did start we were a little late at the line and consequently spent most of the race just following the fleet around, ending up in 9th. In the second race we nailed the start at the boat and had options going up the course. We couldn’t quite hang with some of the faster boats, but we did well to stay engaged behind the leaders and found ourselves with a 5th putting us in 7th after the first day of racing. Not a bad start, but left room for improvement. By the end of the day we started to get a lot more comfortable as a crew and things started getting easier. Post-racing was a trip to the pool and out to dinner with the Cheeky Monkey crew. Racing on Monday got a lot better for us. 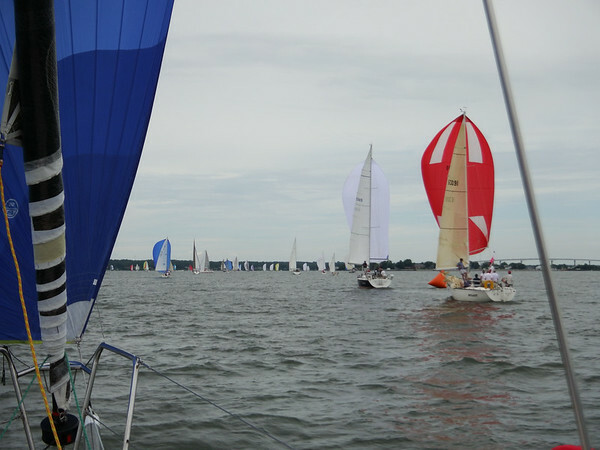 In the first race we still had a bit of a late start and ended up in the middle of the fleet. On the plus side I think we finally got the crew work figured out among us. I was on the mast and my responsibilities were raising and lowering the spinnaker, raising and lowering the board, and calling wind. Now that we were coordinated, I got to pay a lot more attention to the wind, feeding that info back to Mike Karn and Paul in the back, and it really started to pay off for us. By the 2nd race of the day we had a decent start, were one of the top boats around the 1st windward mark and kept playing it smart and fast to pick off a little more time on the boats ahead. We ended up being 2nd over the line to a much faster boat who only corrected out 3 seconds ahead of us – ie: 4 seconds faster and that would have been a 1 for us instead of a 2. The 3rd race of the day went much the same. 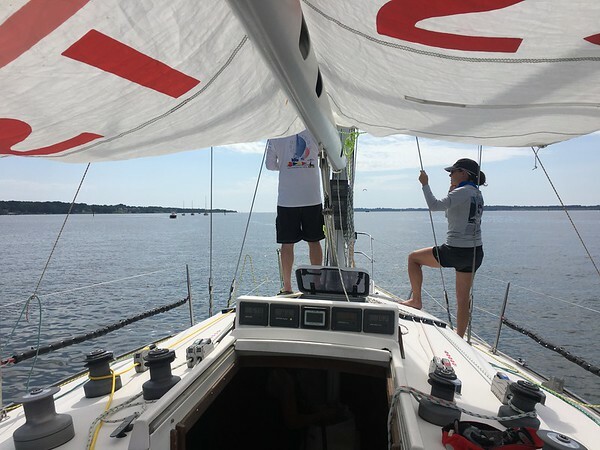 We had a good start, played the shifts upwind, had no major foul ups with the spinnaker at the marks and continued to chip away at the boats in front of us. Unfortunately, the story played out the same and we were over the line 2nd, but the boat ahead corrected to just 5 seconds ahead. We were happy with a 7-2-2 on the day bringing us up to 6th with a 4 point spread between the 3 boats ahead of us. Today was our day and our wind. 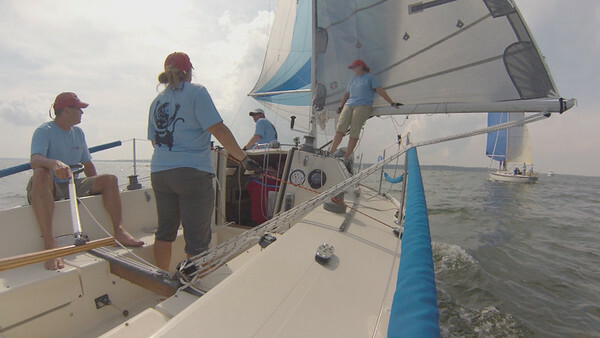 With a more steady pressure of 8-10 knots and partly cloudy skies we were poised to sail well. We had a good game plan and a good read on the weather that proved out to be dead on by the end of the day. Mike and Paul got us a good start and having watched the fleets ahead of us and the wind, I picked out a pretty distinct pattern in the shifts and clouds. From there we punched out, stayed ahead of the shifts and lead wire-to-wire. Right at the finish a few boats rating either the same (Spinster) or faster than us (Easy Button) came up pretty close, but we managed to get over the finish line just ahead of them. The 2nd and final race- this one a 5-leg race was similar to the earlier race – only the shifts got even more dramatic. But the pattern remained and after winning the boat at the start, we got out to the right, picked a couple shifts while covering the fleet and lead at the first mark. Downwind we got caught by some boats who brought pressure and we found ourselves rounding the bottom mark with boats right on our tail. We played it a little more conservative up the middle-right side and Easy Button hit the right corner when a big righty came in, and just went right by us. 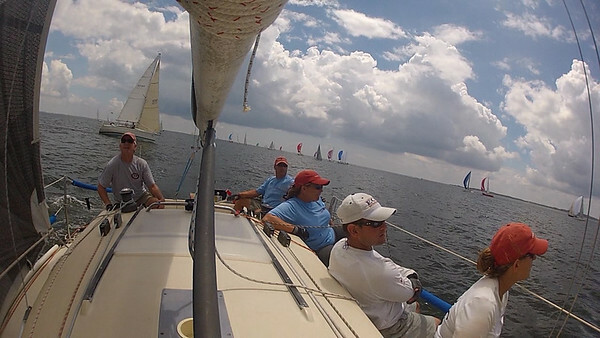 The 4th leg-downwind kept everyone about the same as the wind began to give out a little bit. Many of the boats played the middle left where there happened to be pressure at the beginning of the leg. We knew it was going to go away and eventually come in from the right – just as it had in the previous leg, so we kept ourselves to the right side of the fleet. 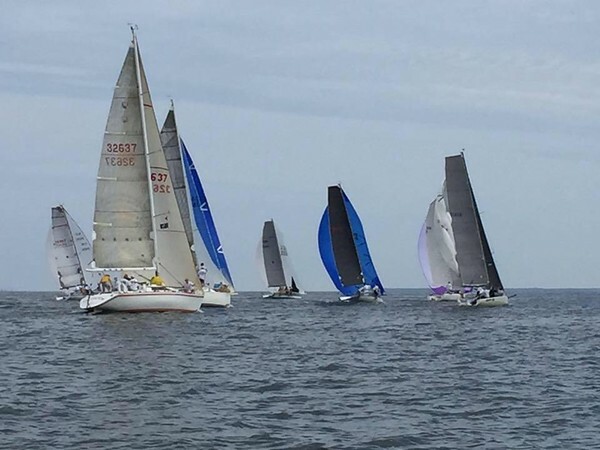 When it finally came in from the right and with pressure, it came way more than we were expecting and we went from being in the middle of the course to laying the finish while all of the boats out to the left were hung out. We took the gun and our second bullet of the day. We were really thrilled at how we did in the last 4 races to string together a solid set of 1s and 2s. That jumped us up to 3rd overall and were definitely the best boat on the day with 2 bullets. 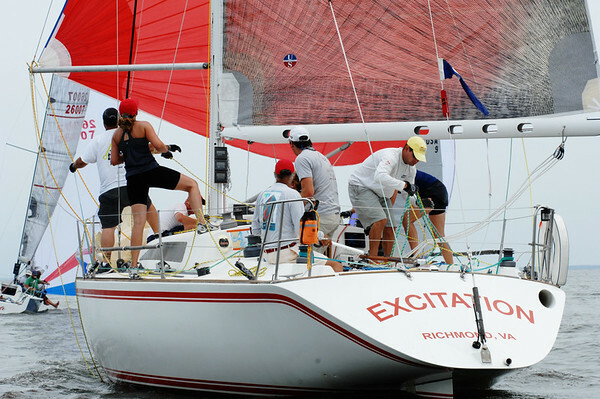 Congrats Paul and Julie Wash – you’ve put a great program together and it was a lot of fun sailing Cheeky Monkey to a podium finish.